WASHINGTON, DC -- A top OSCE official has warned that the human rights situation in eastern Ukraine is worsening and the transatlantic security organization is still barred from entering the Russian-annexed Crimean Peninsula to investigate alleged abuses there. 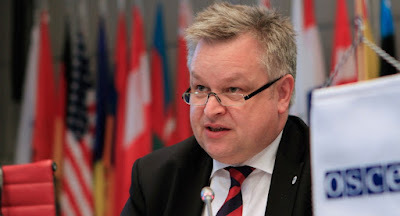 Michael Georg Link, of the Organization for Security and Cooperation in Europe, also warned on February 11 that a lack of regional cooperation was hampering Europe’s response to the refugees flooding the continent from the conflicts in the Middle East. In eastern Ukraine, “the human rights situation in these certain areas.... They are increasingly affected. The longer the war goes, the longer the conflict goes, the more affected they are certainly,” Link told the U.S. Helsinki Commission, a government agency that monitors international adherence to the 1975 Helsinki Accords. Those accords were a landmark human rights compact signed by 35 countries at the height of the Cold War. They also gave birth to the Vienna-based Organization for Security and Cooperation in Europe, which comprises 57 European, North American, and Central Asian countries. Link, who heads the OSCE’s Office for Democratic Institutions and Human Rights, said the group was “very, very concerned” about the plight of the Crimean Tatar population on Crimea, which was annexed by Russia in 2014. With signs that an anti-immigrant backlash is building in Europe amid the flood of refugees arriving from Syria, Iraq, and elsewhere, Link echoed earlier calls from European leaders for a coordinated approach to the problems. “The lack of regional cooperation among states...is a problem. This refugee crisis cannot be solved by one side alone, there must be a joint action,” he said. He also warned the commission about increasing dangers to journalists among its member states, and he focused specifically on Azerbaijan, where Khadija Ismayilova, an investigative reporter and RFE/RL contributor, has been jailed. “Journalists are key to early warning, by the way. A free media landscape, a free media press, is part of the normal early warning process that should happen in a civil society,” Link said.